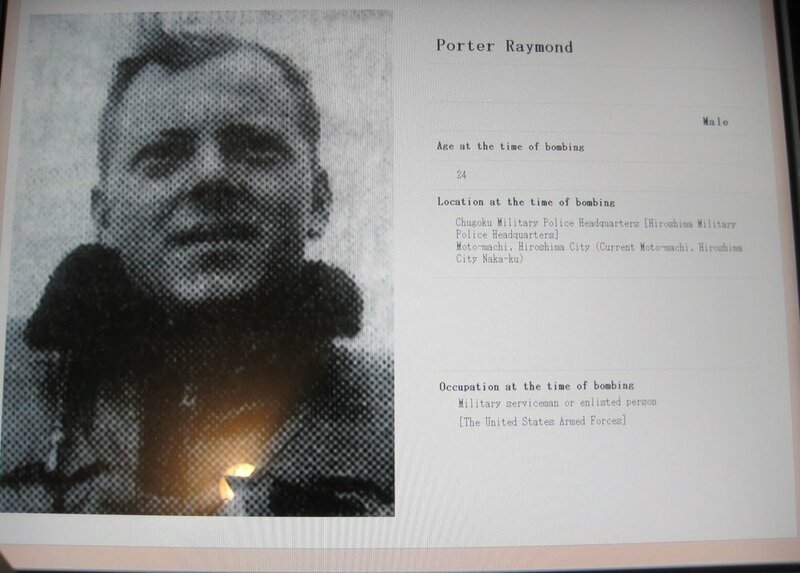 A tribute to Raymond Porter and recognition of his death as an American POW who was killed by the first atomic weapon is shown in this screen capture from the Peace Memorial Hall in Hiroshima. Naval Aviator Raymond Porter piloted the SB2C-4E torpedo bomber shown above with tail number 210. He and his "backseat" Airman 2nd Class Normand Brissette were shot down on 28 July, 1945, while bombing the Japanese warship Tone, which was moored near Kure, Japan. Paul Brehm (who ditched in tail number 206 on 24 July, 1945, after bombing the Hyuga, but was rescued) flew four days later in #205 alongside Porter. Damaged by anti-aircraft fire during their bombing run on the Tone, Brehm and Porter regrouped until Porter was forced to ditch due to anti-aircraft damage sustained during the bombing. Brehm wrote a detailed account of this mission. Depiction of Paul Brehm attacking the Tone right behind Porter and Brissette during the attack on Imperial Japanese Navy warships in Kure harbor on 28 July.